Tamasha is the second offering from Imtiaz–Ranbir duo, stands out in that it reveals less details and opens slowly than it withholds, but still keeps viewers gripped with an amazing screenplay and visuals, which surely is a romantic interplay between two confused souls who re-invent themselves. Bachna Ae haseeno, Yeh Jawaani hai deewani and now Tamasha, the Deepika and Ranbir Kapoor movies are mostly romantic and made for young audience. A gifted young man is bogged down by the weight of expectation. A domineering dad’s wishes come in the way of a fun loving and trapped young man. A beautiful woman comes in his life and makes him escape from his own morass. Essentially driving on the sparkling chemistry of Ranbir-Deepika, this movie is a refreshing take on the magic of love in contemporary world. Filmed in exquisitely resplendent sceneries of Corsica (a mountainous Mediterranean island), the two protagonists meet each other and the hero clears his Catch-22 situation (also revealed by his reading of Joseph Keller’s book of the same name) and gets to know his hidden desires. Well, the story is different as in both don’t divulge their details to each other on order to enjoy the privacy of full anonymity. Not until the second half would the audience get a clear picture of they really are: Ved Sahni from Shimla and Tara Maheshwari from Kolkata. As a part of official commitments, she had to leave Corsica midway and parts away with a peck from Ved… Fast forward to 4 years henceforth when Tara reaches Delhi in search of Ved, but is flabbergasted seeing the man in a completely different avatar. With a broken heart, she decides to move on, but viewers are made to realize he fact that you can’t move on from love. 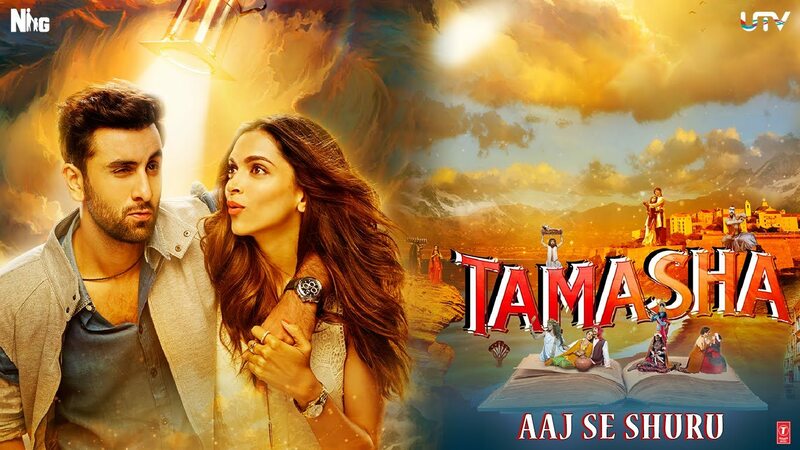 Thus, Tamasha take you on thejourney how Ved changes himself to get back to his beloved Tara. The aura of genuine melancholy and solitude seems to have warped both the lead actors in the movie, the void in the lives of the lead actors strikes you from the beginning. It adds to the beauty – the chemistry between them is natural enough to suggest that it neither seems forced nor actors over-joyed. The shots in Corsica, though short-lived, are very much a gripping narrative, though could have been handled better. The gifted cinematographer Ravi Varman has created a magical spell with the lens captures the intricacies of the dilemma that exists in the characters’ lives: outside they seem contended, but deep inside there’s a void which is trapped in vicious darkness. One of the characteristic scenes which sets the tone for the rest of movie is when Ved meets Piyush Mishra, the storyteller to seek problems of his life. But he gets rebuffed when he doesn’t hear what Ved wants to hear: Mishra snubs Ved that we often seek approval from someone and want them to tell us that our heart’s calling is right, which is not always right. This immediately connects with viewers. Deepika just lights up every frame that she occupies. Though in a lookout for something perfect, she doesn’t lose hope and this makes her stand out – two people eager to find love in one another culminates in the journey of their own self. Though the entire journey is adorable, it just falls short of being satisfying!